We have a huge stock of new spares and parts on the shelf, for all the spitfire models + some GT6 and Herald bits. Below is just a small selection of what we have in stock. We have been stocking up now for over 30 years and may just have that elusive item that you can't find elsewhere. Just drop us an e-mail or give us a call and we can advise there and then of price and availibility. 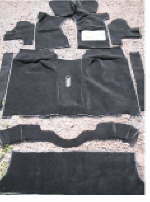 Seat Re-covering kits - black vinyl, excellent quality + ANY COLOUR WITH ANY COLOUR PIPING AVAILIBLE ! MKIV/1500 Will suit both reclining and non-reclining seats £145-00 per pair! Carpet Footwells - just the bit under your feet, again deluxe deep pile quality carpet with rubber heel protectors and waterproof latex backing. £29-00 per pair. EXTERIOR PANELS: Corner Valences - Spitfire mkIV / 1500, mkIII GT6, double skinned fibre glass.with or without captive nuts & cut outs from only £29 - 00 a side.